This is the third generation of the LEGO® MINDSTORMS® Education platform, and the “EV” stands for evolution. What is an Intelligent EV3 Brick? The EV3 Brick is a programmable intelligent Brick that controls motors and sensors as well as provides wireless communication (Wi-Fi and Bluetooth®). What comes in the LEGO MINDSTORMS Education EV3 Core Set? Will all the model builds be available as PDFs? Where will teachers find the BI for Expansion Set models? Inside the EV3 Software: in the Lobby area. What new EV3 Software updates have been made? - New full screen Lobby to navigate through the content provided by LEGO Education, third parties, and, making sure the teaching objective is in focus. - Content is editable directly inside the environment, enabling customization of existing projects or creation of new ones from scratch. - The Content Editor provides a digital workbook for students, where they can capture their work by inserting text, images, videos, and sound, creating their own digital workbook. - The hardware page enables monitoring of the status and values measured by all the hardware elements. - Hardware elements are automatically recognized thanks to Auto ID. - Bluetooth configuration is facilitated by the USB-to-Bluetooth features. - Programming blocks will display a warning symbol if expected hardware by the programming block is different from the detected hardware by Auto ID. - Probes enable seeing the values go through the data wires. - Simple strip programming by snapping blocks together (no need to use the beam anymore). - Block parameters are configured directly on blocks. - Read the program sequence directly on blocks. - Improved sequence wires facilitate showing the structure of the program and create parallel execution. - “Wait for change” has been added to easily create robots that behave according to change in the environment, as opposed to waiting for the threshold, which only works by comparing measured values. - Data wires are improved and data casting has been added to simplify data type conversion. - Arrays integrated in the standard blocks. - Loop Interruption is now possible, enabling the creation of advanced state control mechanisms. - Oscilloscope Mode enables live monitoring of the sensors to prepare experiments and validate setup. - Dataset calculation is integrated, enabling analysis of the data coming from the sensors. - Graph programming added; this feature enables users to create zones in the graph that will make the robot react in the physical world based on the data in the graph. In what languages is the LEGO MINDSTORMS Education EV3 Software available? Can you use EV3 Software on both a Macintosh and PC? The EV3 Software can be used on both Macintosh and PC platforms to program LEGO MINDSTORMS Education EV3 Bricks. How do I update the EV3 Software? Under Help at the top menu bar of the EV3 Software, you can enable the EV3 Software to automatically check for updates. By clicking Check for Software Updates, a check mark will appear and the EV3 Software will regularly check for updates. (This requires an Internet connection.) If a relevant update is available, you will be notified by the EV3 Software. If you wish to install the EV3 Software update, you will be taken to a website where you can download the update file. Once downloaded, you can install the update. Besides the EV3 Software, you can use also LabVIEW and RobotC. EV3 Software is an open-source platform, and, therefore, we anticipate the MINDSTORMS community to develop additional languages such as JAVA. Is there EV3 Brick Programming? Yes. We have continued and improved the EV3 Brick Programming App with the LEGO MINDSTORMS Education EV3 Brick. Students can easily program basic tasks on the EV3 Brick and also conduct basic Datalogging. All of the EV3 Brick Programs can be uploaded into the LEGO MINDSTORMS Education EV3 Software for continued and advanced work. Can I program retail MINDSTORMS Hardware with my LEGO MINDSTORMS Education EV3 Software and vice versa? Yes. In theory, it is possible. However, in reality, it is difficult since the two products differ significantly. The retail software version does not include all of the programming blocks needed for the education hardware, and it does not include Datalogging or the teacher version of the Content Editor. Also, it is not possible to utilize the Robot Educator Learning Tool together with the retail set as it is not possible to build the Robot Educator model. Will there be tools to create my own Software Programming Blocks for LEGO MINDSTORMS Education EV3 Software? 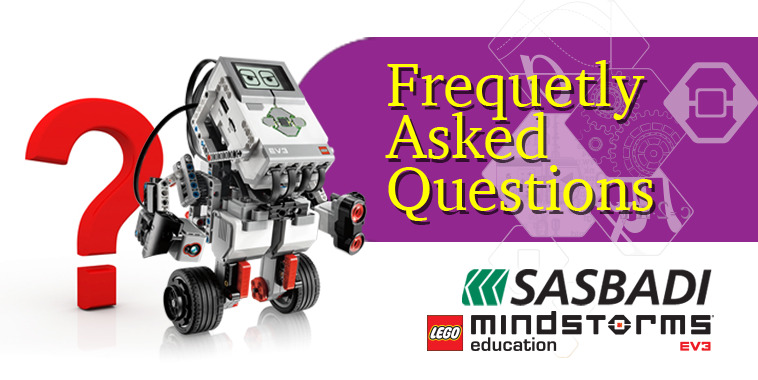 Can I program the LEGO MINDSTORMS Education EV3 Brick using NXT Software? What is the longest length of the program for onboard programming? Sixteen blocks (excluding the Start and Loop Block). Will there be a pdf which shows how to program both on brick and computer? There will be a pdf User Guide which will give a short introduction to the EV3 Brick Programming App on the EV3 Brick and describe how to make a program there. For EV3 Software Programming, there will be two Quick Start videos in the Lobby which will introduce the user to programming. In addition, there will be a large number of Robot Educator Tutorials teaching how to program in the EV3 Software. Is there a print function for the programming? Can one take a screenshot of the whole program? Yes, in the Print settings, you can choose to print the entire view (all of the program(s)) or just the part of the program visible on the screen. Also, you can zoom out so that the entire program will fit within the screen. - Autonomous Datalogging: Log data on the EV3 Brick and upload to the EV3 Software. - EV3 Brick Programming Datalogging: Set up and execute Datalogging directly on the EV3 Brick. - Oscilloscope Mode: View sensor data as soon as connected. - Prediction Tool: Draw or make predictions. The onboard Datalogging program: Can this be autoscaled? The graph area in the EV3 Brick Datalog App will automatically adjust to the (full) scale of the sensor used (e.g., 0–250 for the Ultrasonic Sensor, 0–100 for the Color Sensor). It will not autoscale within this range, e.g., in case the sensor readings are only giving low values.